Born in 1928 at Palmerston Street, ‘Old Westwood’, Roy started work at Jacksdale (Codnor Park & Ironville) Co-Op. He was a ‘flour boy’ which says Roy, means ‘general dogsbody’, working out back weighing up loose flour and sugar and anything else he was told to do. He earned 6s/9d a week (34p), but my, you could do a lot with threepence in those days! Roy later moved on to the Co-Op milk round, walking up to the top of Riddings Hill to feed and get his horse ready at 4am every morning. It was a seven day a week job and paid £1/5s (£1.25p) a week. If your horse needed shoeing you’d take it up to the farrier on George Street and one day the lady vet was called in from Crich to sort out a horse with toothache. She took out a very large pare of pliers from her bag and pulled out the troublesome tooth which was six inches long! Happy memories of Westwood in the WW2 years, making rations stretch by swapping with neighbours and that call from the Royal Oak who would announce they’d be open for half an hour as they’d got some beer in. 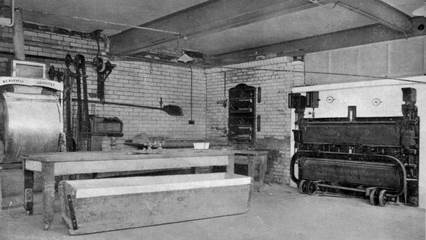 Photo: Interior of the Co-Operative Bakery at Dixie Street, Jacksdale.